Very compact portable scanner for the road trip. The VR-160 has a solid aluminium die-cast chassis and a crisp LC matrix display. The receiver covers 100kHz up to 1299.995MHz continously, no gaps. Receive modes are AM, AFM and WFM. 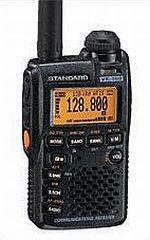 The size of the scanner is the same as that of the Yaesu handheld radio VX-3E, using some optional accessories from this radio as well. The VR-160 hand scanner features many functions, which or otherwise know only from larger receivers. More than 900 memories, organized in 24 banks, offer a lot of storage for all interesting frequencies. A band scope facility shows up to 50 adjacent channels. The internal ferrite antenne improves reception on AM bands. The scanner supports SQL operation with DCS and CTCSS.